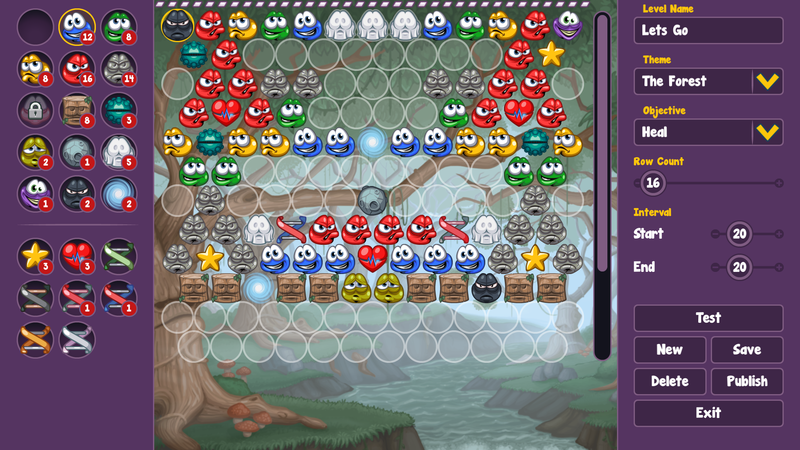 Level Editor allows you to create your own levels with everything in Doughlings: Arcade. You can create, share it with other players or even play/rate other levels created by players around the globe. Targets, DNAs, difficulty and even the background is up to you. With its user-friendly interface, you can show your creativity to the world in no time. In the Create menu, you are granted with tools to craft your very own level. As you progress in Doughlings: Arcade, new items will be available for you to use and you can choose and use whatever you want. The only thing that you should consider is the design rules. Here are the rules that every player should learn before creating a level. You can’t use stuck targets in healing objective. You can’t put stars in freeing stuck objective. You can’t use totems or wormholes to the top row. Two mines can’t be placed side by side. There can’t be 2 or more stuck targets at the side of a stuck target. There can’t be 2 or more indestructible targets at the side of a stuck target. You can’t put map objects under lives, stars or DNAs. There must be at least 3 stars in healing objective. There must be at least 3 stuck targets in freeing stuck targets objective. The number of both stars and stuck targets must be divisible by 3. There must be at least one map object at the side of stuck targets. The wormhole limit for each level is row count/6. By following these rules, you can create any level with any crazy ideas and share it with the world. Don’t forget that you can always save your design and continue to edit later or delete. Beware that it is not possible to edit or delete any published level so check twice before releasing any level to the public. Besides creating your own levels, you can always play other designs from many players around the world. At the Play menu, there is no requirement or rules. You just need to choose the level you want and click to play. It is possible to like or dislike any level that you complete and adding them to your favorites. At the browse menu, there are some icons that you should know their meanings. Thumbs up: Shows how many players liked that level. Play: Shows how many times that level is played. Guitar: The success rate of that level. Cup: High Score of that level. Each level comes with a “preview” option which can be seen on the right side of levels. This will help you to see how the level is designed, which targets are used and how is the overall difficulty of the game. And you can always search the level you want to play at the Search menu with the level name, player name or ID. This entry was posted in Announcement, News and tagged doughlings, steam. ← Doughlings: Arcade – Where to Buy Doughlings?